BOONTON, N.J. — Annual sales of optical networking equipment worldwide are forecasted to increase at a compounded rate of nearly seven percent, growing from $17.8 billion in 2008 to $24.7 billion in 2013 as carriers begin upgrading their long haul and metro networks to handle increases in image-based traffic, says a new market research report from Insight Research Corp. According to this industry analysis study, optical equipment sales are being spurred by various hybrid approaches meant to achieve today some of the benefits associated with tomorrow’s all-optical network. 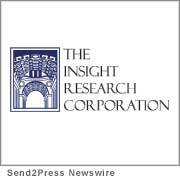 According to Insight’s newly-released market analysis report, “The All-Optical Network: The Roles of Hybrid Transfer Nodes for Optimization in SONET, DWDM and MPLS Metro and Long Haul Networks 2008-2013,” the advantages of all-optical networking includes greater flexibility in routing and switching optical signals, low cost, zero-interference processing of signals at intermediate nodes, and the elimination of optical-electronic-optical conversion of signals. The study found, however, that true all-optical networking is years from realization. In the meantime, optical networking engineers have developed hybrid approaches to optimize their manufacturing processes, transmission technologies, and transport protocols in order to win some of the benefits of all-optical networking immediately. Insight Research identified Carrier Ethernet, generalized multi-protocol label switching (GMPLS), reconfigurable add-drop multiplexers (ROADMs), and photonic integrated circuits (PICs) as areas where the hybrid approach to an all-optical network is most evident. “All-optical networking will drop operational costs and increase throughput, but the reality is that true end-to-end optical networking is still years away,” says Robert Rosenberg, President of Insight. “In the meantime, various hybrid approaches such as Carrier Ethernet and ROADM at the transport level, GMPLS at the protocol level, and PICs at the device level are all being applied to win the benefits of optical networking today,” Rosenberg concludes. A free report excerpt, table of contents, and ordering information is available online at http://www.insight-corp.com/reports/optical08.asp. This 189-page report is available immediately for $3,995 (hard copy). Adobe Acrobat (PDF) report licenses are also available.